In 2015 we hosted a nation-wide Ambassador Model Search, looking for the new fresh faces of Just Dance Customs. With over 100 applicants, we selected 10 Finalists and 3 Winners. We were thrilled to welcome Kali, Jada and Sofee as our 2015 Model Ambassador Winners! ​In 2016 we hosted our 2nd nation-wide Ambassador Model Search, and received an overwhelming 300 applicants! After combing through so many amazing applications, we selected 10 Finalists and 3 Winners. We were so excited to welcome Julie, Kasey and Nevaeh as our 2016 Model Ambassador Winners! ​In 2017 we hosted our 3rd Ambassador Model Search, and received an unbelievable 400 applications! With so many amazing choices, we selected 13 Finalists and 5 Winners. We were thrilled to welcome Jocelyn, Karina, Mackenzie, Reagan and Ying Lei as our 2017 Model Ambassador Winners! ​In 2018 we hosted our 4th Ambassador Model search and received another unbelievable 400 applications! After reviewing all of the fantastic applications, we chose 13 Finalists and 5 Winners. We are so happy to welcome Destiney, Mimi, Malia, Berkley and Kennedy as our 2018 Model Ambassador Winners! We are thrilled to welcome them to the JDC Family! Victoria has been dancing all of her life! She is trained in all styles and has won numerous awards for her solos and group numbers throughout the years. She currently dances at Lifesong Studio in Grapevine, Texas. She has been modeling for Just Dance Customs for 5 years and wears their dancewear to class on a regular basis! Victoria in an Officer on the Byron Nelson Bobcat Dazzlers Drill Team and is in her Junior Year of High School. Aria is an 11 year-old dancer from Texas. Starting at the age of 4, she developed a passion for all aspects of performance – the dance, the costumes, the music, the sets, and the energy of the audience. Though trained in various forms of dance, her favorite style is jazz because of its high energy and bold personality. Over the past few years, Aria and her competitive dance team have won numerous awards and titles. An equally devoted student, Aria’s favorite subjects are writing and science, and she is currently writing her own original book. Aria also enjoys playing piano, reading, exploring nature, and hanging out with family and friends. Her love of dance and fashion make her delighted to be a model for Just Dance Customs! Ying Lei or as her friends call her “Lei Lei” is 12 years old and from Cincinnati, Ohio. She has been dancing since the age of 3 and on a competition team since the age of 4 at Just Off Broadway Dance Studio. She trains in all genres of dance including ballet, jazz, tap, lyrical, contemporary, musical theater, hip hop and acrobatics. She has won many regional and national competitions and titles. She most recently passed on her crown of Junior Miss Dance of America 2017. In addition to training at her studio, Lei Lei loves to travel and attend conventions and master classes. She has won many convention scholarships which include NUVO Breakout Artist, JUMP VIP, 24Seven Non-Stop Dancer, NYCDA Outstanding Dancer, & Velocity MVA. She has also been named Top 10 Mini Best Dancer & Top 20 Mini Best Dancer at The Dance Awards in 2015 & 2016. In 2016, she was awarded the Titans Force Award which allows her to travel with the Titans of Dance Tour and assist the faculty this upcoming season. She feels that dance is always evolving and that each person has something special to offer and to learn from. She also enjoys meeting new dance friends from across the country through her travel experiences. It was an honor for Lei Lei to be named as a Just Dance Customs Ambassador in 2017 and to meet her JDC family in Texas. She is thrilled to remain a model for JDC. She truly loves to be unique and stand out through her dancing and her dancewear. Since Just Dance Customs is custom made, the styles & choices are endless and guaranteed to make a statement. She is so excited and grateful for this upcoming year with her Just Dance Customs Family. Jenna was a competitive gymnast until she began to crave more emotion and creativity in her floor routine, than the rules allowed! The last 3 years of dancing have ignited a fire in Jenna, that is constantly fueled by training in every style that is available to her. By her 2nd year of dance, she was being awarded Titles, Scholarships, and Special Honors. This busy 14 yr. old loves to be in the spotlight, and is always looking for opportunities to be in front of the camera! Jenna is the 2018 Idaho IJM Jr Teen, trains and competes for Studio C, and is on her H.S. Varsity Dance Team, as well. She is SO proud and grateful to be a JDC model!!! 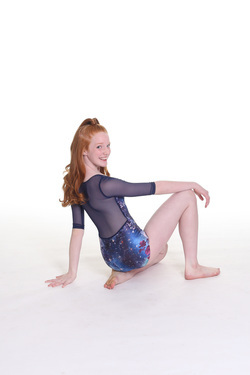 These beautiful leotards are cut for perfect coverage- to look great and stay in place throughout the most active days of dance! Destiney is currently 9 years old and from Kentucky, she is a true fan of the University of Louisville Cardinals where she hopes to attend one day. Destiney has a strong passion and love for modeling, acting, and dance since she was able to walk. She loves to be on a stage or in front of the camera working with different photographers. Dance has created a platform for her to express her emotions through movement and really opened her up to her love for modeling. Destiney is a Studio Dancer where she is also on the competitive team. She is trained in different styles of dance but her favorite is Contemporary and Acro. She may only be 9 years old but she has such a busy schedule between photoshoots, dance training, privates, and working with her personal trainer that she stays busy and never complains. She always pushes herself to be better and try new things. She has such a strong and passionate work ethic always giving 100% to everything she does. Education is also very important to her and she continues to jump leaps and bounds setting goals at school as well in her extra circular activities. She is a straight A student who scored the highest in her class this past year on the State Testing along with over achieving her reading goals for the year. In her free time she loves to spend it with her friends and family. She also loves to travel meeting new people and seeing different historical sights all around. She has a Journal and a map that she checks off all her adventures. Destiney has a huge personality and loves to make people laugh, most that have had the chance to work with her or meet her have all seen her very silly and bubbly side. Along with that she also has a huge heart and loves to look after her brother who needs a special kind of care. Since she was 6 years old she has been donating to the Ronald McDonalds House Charity and Cincinnati Children’s Hospital with her own money she earns from chores. She loves to give back to the community and does volunteer work a couple of times a year with organizations that are for the Special Needs like the Make a Wish Foundation, March of Dimes, Ronald McDonald House, and a Special Needs Park on the Beach. She is excited to be a 2018 Just Dance Customs Ambassador Model! Eleanor is a spunky and sweet 4th grader from Southlake, TX. She proudly hangs her competitive dance shoes at Ambition Dance Productions, and also does Aggie style partner jitterbug dancing with the Lil’ Wranglers of DFW. Eleanor has dyslexia, but she sees it as her own personal SuperPower!!! She wants everyone to let their own superpowers shine through by believing in yourself! Eleanor is proud to have modeled for JDC for the past 2 years! Sutton is a 4 year old dancer and model from Texas. She has been dancing since she was 2 years old and has loved every minute of it! She also loves acting and auditioning and recently appeared in a National Commercial for All State Insurance Company. She is represented by Grit Talent Agency. Sutton loved being a part of the JDC photo shoot and wants to be just like the older models when she grows up! Malia is 11 years old, a straight A student in 6th grade attending Florida Virtual School and is in her 8th season as a competitive dancer with the Starz Dance Company! She is trained and competes in all styles, but her first love continues to be Contemporary, with Musical Theatre a close second! She has been a member of the NBA's Orlando Magic Minis Jr. Dance Team since she was just 3 years old and had the great honor of performing in the 2012 NBA All-Star Game just before she turned 5! She absolutely loves cheering on her home team and performing at NBA games! Malia's greatest achievements in 2018 include being named a Mini Breakout Artist winner at NUVO Orlando, earning the privilege to be a Showstoppers All-Star when her Musical Theatre solo placed 1st Overall in the Jr. Division, being crowned a 3-time Regional Title Winner, being crowned the National Jr. Miss Believe Title Champion with her Lyrical solo and achieving her goal of becoming an Apprentice for Starpower's Power Pak Summer Dance Intensive!! In addition to representing Just Dance Customs, Malia is an Ambassador for Oh La La Dancwear and DANCEspired Life. Malia is a 3rd generation Dancer as her grandmother was a Polynesian hula dancer, her Mother has made a career in the dance industry and she now aspires to be a professional dancer when she grows up! She loves her 2 kitties Scout & Daisy, loves watching Cirque du Soleil and Broadway shows, has become quite the make-up artist and enjoys swimming and going to the beach when she's not at the Studio! Samara started dance at age 3. Now 9, she enjoys competitive dance and performance, especially jazz, tap, and hip-hop. Working hard with her team in the studio, giving the audience a high-energy, memorable performance, and wearing amazing costumes are a few of her favorite aspects of dance. Besides dance, Samara’s other life passions include her dog Chloe, books, swimming, playing piano, and learning new things. Samara loves dancing in her beautiful Just Dance Customs dancewear and is thrilled to model with her sister Aria! Jocelyn brings a combined 14 years of dance experience to the JDC family. Jocelyn is well versed in all genres of dance and is a sought out Young Choreographer in the industry. Jocelyn travels vigorously across the country to continue her dance education with many famed choreographers and competes locally in her hometown of Newark Delaware with her Elite competition team. Jocelyn is a Professional Dancer/Model/Actress represented in LA with Movement Talent Agency under the direction of Jim Keith and in NYC by Joy Talent and Infinity Talent Management. Jocelyn has been featured in several music videos, magazines, opened on stage for credits such as "KidzBop Tour", ABC Thanksgiving Day Parade and The Wawa Welcome America events. She has also appeared in several films as both a Dancer and Lead Actress. This year, Jocelyn was hired to be a Choreographer in an upcoming "new" Pilot TV Series that will be hitting your television upon completion of the series filming. Jocelyn holds numerous Regional and National Championships and Titles and is also an ALL-STAR dancer for the NESDC. Jocelyn also holds the title of a WILD APPRENTICE for the Wild Dance Convention and Star Dance Alliance and travels the country assisting on their convention tour. When Jocelyn isn't juggling her career as a Dancer, Model and Actress she is busy with owning two non profit charities "Jocis Journey" & "It Begins with a Smile, Costumes for a Cause" both of these help the underprivileged children in our communities and around the world and has been named an Ambassador of Dance. Jocelyn aka "Joci" is also a dance teacher at her home studio Encore Dance Academy and a Gymnastics Instructor at Dream Chasers Gymnastics both in Delaware. Joci also attends Cab Calloway School of the Arts High School where she is a Dance and Choreography Major. Joci has had the privilege of being a part of the Just Dance Customs family as an Ambassador Model Winner in 2017. She has been honored to have met many friends, Mrs Cara and Mrs Anita through this adventure and could not be happier representing JDC again this year! Thank you so much for the opportunity to represent you and their amazing dancewear line. .
Mimi is 11 years old and has been dancing since the age of 3 and competitively since the age of 5. She loves all styles of dance but her favorites are jazz/musical theatre and contemporary/lyrical. She loves gymnastics, volleyball & tennis and enjoys spending time with friends and traveling. Mimi has 3 brothers and is half Thai. She hopes to dance in college and someday either become a Rockette or dance for an NBA team. She is excited about being a 2018 Just Dance Customs Ambassador Model! Erin is a fun-loving 11 yr old dancer, actress, and model from colleyville tx. She attends the Fort Worth Academy of Fine Arts and is on company at Ambition Dance Productions in Grapevine, TX . Erin is represented by The Clutts Agency in Dallas. Erin loves dancing most of all but also enjoys hanging out with her friends and family, swimming, making slime, anything crafty and also riding her dirt bike! Her proudest dance accomplishment is winning the title of Petite Miss Starquest Dallas 2016. Berkley is an 11 year old dancer from Texas. She trains in all styles of dance with ballet and improv being her favorite. She also enjoys aerial silks, and gymnastics, with the hope of performing for Cirque one day. Berk is entering her 5th year of competition dance and has won numerous crowns, titles. team jackets, scholarships, and special honor awards. Her latest accomplishment is a PRO REVELER position where she will tour with Revel Dance Convention and assist classes. Berkley's second love is modeling and has been blessed with many opportunities. You can see her in several dancewear catalogs, commercials, billboards, magazines and even her voice on a new Apple App! Berk loves the stage and the camera. She lives BIG and has a BIG personality to match. She loves the style and uniqueness of JDC and is honored to be part of the family. Jada is a Senior at Booker T Washington High School for the performing and Visual Arts. She has danced at Prodigy Dance and Performing Arts Centre since age 10. Not only strong in the arts, she is a Presidential Academic Scholar for grades 6 through 8. Her extra curricular activities include National Junior Honor Society and National Charity League. She has won many titles and overall awards at regional and national dance events including; Miss Starpower and 1st overall 2014, Miss Showbiz 2015, First Place Teen Solo Jump Dallas 2015, Break the Floor Teen Winner Nuvo/Jump/24Seven 2015, and Teen Miss Dance America 2015. She is excited to have modeled for Just Dance Customs for 2 years. Nevaeh is a 16 year old dancer and model from Houston Texas. Nevaeh dances at DanceZone as a Protege under the direction of Sheila Milner in Houston Texas who has taught her to believe in herself and take risks. Nevaeh was just named the Tremaine Female Senior Dancer of the Year for the 2017-2018 season and has been on the Tremaine Performance Company for the past two seasons. She is passionate about constantly growing and challenging herself. Nevaeh hopes to inspire other dancers to overcome their fears and always work hard. She feels it has been such an honor to have served as an Ambassador Model for Just Dance Customs for the 2016-2017 season and as a model! ​Karina is a 15 year old dancer and model from sunny south Florida! She has been training extensively for the past five years in dance. She studies Ballet, Pointe, Jazz, Lyrical, Contemporary, Improv, Acro, Rhythmic Gymnastics, Tap and Hip Hop. She also competes on a National Champion Team at The Studio Dance in Hollywood, Florida. Karina is a two time National Champion dancer and holds countless first place trophies and scholarships. She has trained at the Joffrey Ballet and Jazz Summer Program in New York. Karina has had several opportunities to help her pursue her dance career. She has performed for Disney at Disney Springs in Orlando, Florida and also acted as a stand in for a rehearsal with Sharna Burgess and Antonio Brown, from Dancing with the Stars! Karina was also published as Big City Kids cover model. She loves to be in front of the camera and has so much fun modeling and dancing. Karina is so happy to represent and model for Just Dance Customs! Kennedy is a 9 year old competitive dancer and model from California. She is excited to be a 2018 JDC Ambassador Model! She trains 6 days a week and up to 7 hours a day in dance. She trains in ballet, jazz, lyrical, contemporary and tumbling. She started dance at almost 4 years old and went on to compete with a jazz solo that season. Since then she has won numerous 1st overall awards in the advanced division at many different competitions all over California and in Nevada. Kennedy is also an overall photogenic and title winner at both the regional and national dance competition level. When Kennedy isn’t dancing you can find her poolside or at the beach. She loves swimming. Kennedy also loves colleting things like Squishes, Shopkins, Beanie Boos, stuffed animals, Barbies, American Girl Dolls and Littlest Pet shops. In the future Kennedy dreams of becoming a professional ballerina or famous dance choreographer. Avery is 10 years old has been dancing for four years. She dances at Prodigy Dance and Performing Arts Centre and has been on the performing company the past four years. Avery was named one of the Top 20 Mini Female Best Dancers for the Dance Awards in 2017 and also was named to the Top 10 for mini solos at The Dance Awards in Orlando. She also earned first place classical in pre-competitive and also earned Top 12 in contemporary for YAGP Dallas in 2017. Avery is also a Breakout Artist winner for Nuvo Dance Convention, a VIP winner for Jump, a Nonstop Dancer for 24/7 and is also a ASH apprentice winner. Avery has won the overall solo titles for Showbiz, Starpower, Revolution, KAR, Odyssey and Showstoppers. She is very thankful for her teachers and dance family and Prodigy! Avery enjoys dancing all styles of dance and is in the studio training whenever she can. Besides her passion for dancing, she also enjoys drawing, spending time with her friends and family and loves to shop! She is most happiest when she is helping others and getting to spend time with her best friends from Prodigy! This is her second year to model and she could not be more thrilled that it is with Just Dance Customs. She is very thankful to be apart of this amazing company and family and she loves to wear their cute and fun dancewear to conventions and rehearsals! Kali began dancing at 18 months old at her mother's studio, Chrissy's Dance Academy. She began dancing competitively at the age of 8 and it quickly became her passion. Kali currently holds the following titles: Miss KAR San Antonio 2013 Miss Starpower Austin 2014 Rainbow Dancer of the Year Austin Regional Winner 2014 and 2015 Miss Act 1 Austin 2016 National Title: Junior Miss Starbound 2014, Miss Star of Hope 2015 Teen Miss Starbound 2016. She also enjoys modeling and has been hired to appear for 4 years in Curtain Call Costume Catalog. And for the last 2 years, she has appeared in Glamour Costume Catalog where she shot in New York City. Kali was chosen in a nationwide search to appear with Celebrity Dance Convention. She can been seen modeling their clothes for Celebrity and Co. Kali has served the last 3 years on the Tremaine Performance Company touring with Tremaine Dance Conventions assisting classes and growing as a dancer! Kali has had the pleasure of working with Tokyo and perform in his Move The World Charity Showcase. She was also a finalist in the Atlanta Audition for Season 4 of Dance Moms and has taken class from the ALDC in Pittsburgh, PA. Kali's favorite place is Los Angeles and she travels there to take class a few times a year! Her true passion in dance is attending conventions, master classes and taking class from new choreographers and teachers. Dance and modeling have given her the opportunity to travel the country! Kali has been modeling for Just Dance Customs since 2015! Chloe is a competitive dancer from Texas and has been dancing since she was 2! She started competing at age 7, which is the age she truly found a passion for dance. She is trained in all styles of dance and has won numerous awards throughout her dance career. She continues to train by attending dance conventions throughout the year. Chloe's favorite styles of dance are jazz, ballet & Contemporary. She loves to dance because it is a way to express herself without having to use words. Chloe enjoys modeling and has modeled for Just Dance Customs for 3 years now. She loves all the dancewear from Just Dance Customs because they are so comfortable and super cute! and one day, she hopes to combine her two passions of dance &amp; school to become a Meteorologist, and a Rockette or a Dallas Cowboy Cheerleader!